Michelle Danyluk - Michelle Danyluk, Ph.D. Originally from Calgary, Canada, Dr. Michelle Danyluk wanted to move away from the cold weather to live somewhere warmer--specifically somewhere with palm trees. Eleven years later she finds herself at the University of Florida where her main focus is on tomatoes. Her interest in food science goes back to the early classes she took as an undergraduate when her original major of bio-chemistry transformed into microbiology. CPS staffer Alyson A. Barnes spoke with Dr. Danyluk about her career path and newly funded project. How did you learn about the CPS opportunity for funding? What led you to apply for funding? I left the University of California, Davis, in 2007, right when CPS was getting its feet on the ground funding some of its earlier projects of leafy greens. Anyone who is serious about produce safety research is now aware of the opportunities at CPS. Martha Roberts, University of Florida Institute of Food and Agricultural Sciences, forwarded the RFP to me and said there were some good opportunities available. 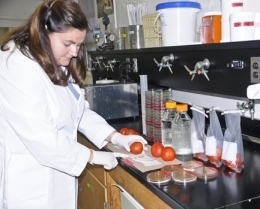 We were already doing work related to microbial transfer and there were a couple of research priorities where the Florida tomato industry was calling for proposals associated with what we were studying. CPS awarded your project “Pathogen transfer risks associated with specific tomato harvest and packing operations.” Can you tell me a bit about the project? In Florida we have the Tomato Best Practices Manual, which includes A Guide to Tomato Good Agricultural Practices (T-GAP) and Tomato Best Management Practices (T-BMP). One thing that T-GAP calls for is removing dirt and field debris from tomatoes when they are packed and shipped. We are trying to understand how the removal of that field dirt may move pathogens around in the product. Another practice common in the tomato industry is to reuse tomato cartons. We really wanted to understand the risks associated with removal of field debris and the reuse of these cartons. You seem to have an interest in tomatoes—is it something you acquired while in Florida? I would say that I have always enjoyed tomatoes, but I didn’t start working with them until a couple of years after I arrived in Florida. I think tomatoes are an interesting system and they have had quite a few outbreaks associated with Salmonella. I think the tomato industry has done a very good job of being proactive in doing research to find out about the food safety of tomatoes. It’s a good fit for the type of research I like to do. What do you hope the industry will take away from your project? I hope the results of our science-based research will inform industry how different types of practices will increase or decrease the risk associated with their product. Where do you see food safety in five years? That’s a really difficult question to answer. In the last decade we have seen a move toward a more risk-based approach to safety, and I think that will continue. I also think it’s inevitable that we will continue to see the focus on pre-harvest food safety, especially in produce. I think there are a lot of fundamental questions about pathogens and produce environments that remain to be answered. What is an average day like? Outside of the produce world, how do you spend your time? There is not an easy answer to my average day. It depends really. I don’t spend a lot of time in the classroom because I am an extension agent. I spend a lot of time behind a windshield travelling to different talks, meetings with stakeholders and sometimes I’m out in the field or in an extension classroom. I would say every day is different in my world, and because of this I cherish time I spend in my office. Outside of the produce world I enjoy vacationing and spending time with my family. My top two hobbies are gardening and knitting.